This morning I awakened early before it got too hot so I was able to have my quiet time on the outside patio. This song was playing in my head so ...I sang it aloud. I noticed the bunnies in the yard didn't run away from the sound of my voice. I had to laugh because my singing voice isn't anything to write home about. But I'm sure the Lord doesn't mind. It's the heart intent that really matters and my heart was praising Him. The video is nice, I esp. like the picture of Jesus holding the child. I just love to feel close to Jesus. I haven't heard this worship song in a loong while. I remember when my little brother was a baby, this was one of the songs I sung to him as he fell asleep. =D I love the singer's voice - it's very soothing. Oh my memories go back with this beautiful song...it still comes to my heart many times through out the year. My husband was the praise and worship leader for years when we sang this song...thanks for sharing...I will lift my voice today!! Happy Saturday to you! 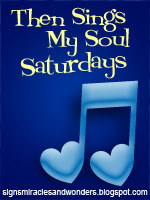 I am lifting my voice this morning...and my soul is rejoicing! A beautiful song. Thanks for sharing, Debbie! One of my all time favorite worship songs. Really lifts my spirit up this morning. Smiling thinking of you singing out loud... it would have been a duet if I had been there! I love this song too... a great way to head into the weekend! Simple, beautiful and the notes of our heart. Thank you Deb for sharing this beautiful and pure song of love for our Lord. ...and I sang right along & loud with your Heart Choice, Debbie. Blessings Debbie and so glad that you had time away to be refreshed & rest & now blessed, you are sharing your love even with the bunnies. I'm sure that they delighted as I did listening to this old time favorite that stay in your heart! Now it will be in my head but I'll enjoy... thanks! EnJOY a very blessed time in His Presence. I used to sing alot when I was alone, before I got nodules on my vocal cords...but now I sing in my heart and listen to music more than I sing. But having alone time early in the morning is my favorite thing! You chose a beautiful version of this song. It's one of my favorites. Have a great weekend. Love Jesus.....and may that be a sweet sweet sound in His ear! Debbie the songs has prepared me for worship today. Thank you for sharing and such a lovely post. Blessings. I cannot tell you how happy I am to have found your blog. I have been reading your posts with tears in my eyes. I identify with your place in wanting to be alone with God and the need for long periods of quiet time with the Lord. Oh, Debbie, please continue to write your beautiful posts. You have, indeed, blessed me today. I am, of course, a follower as of today. Beautiful song of praise...what a picture of a wonderful morning! Such a lovely praise song.